1. Pick up a can of Texas Tailgate® Chili Sauce at your local grocery store. 2. Dress your dogs with Texas Tailgate® Chili Sauce and take pictures! 3. 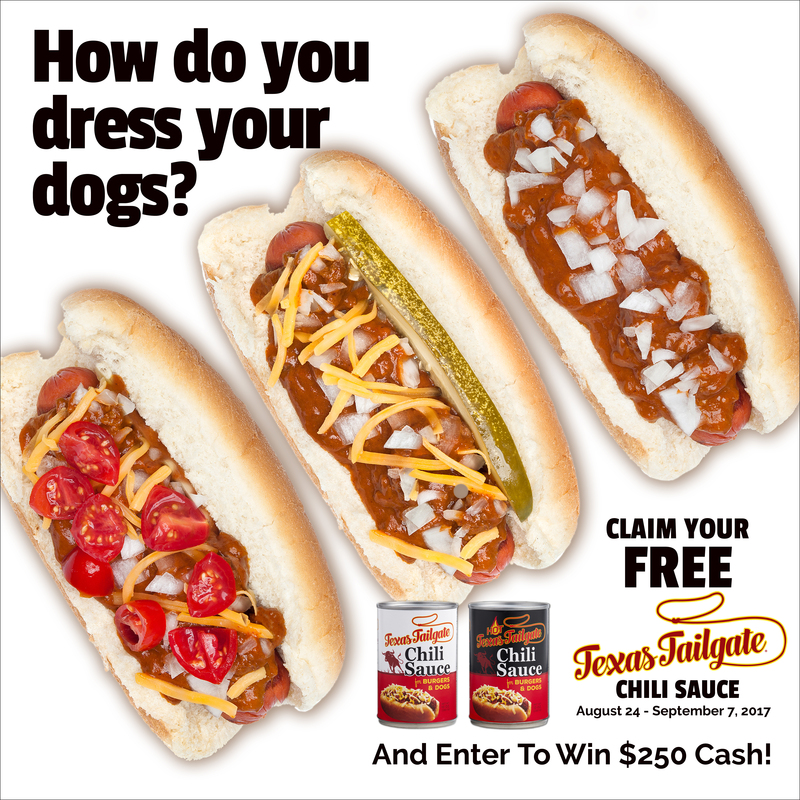 Register and submit pictures of “How you dress your dogs” with Texas Tailgate® Chili Sauce. 5. Your photos will automatically be entered in the Grand Prize contest for a $250 Cash Award! And automatically be entered in the Grand Prize contest for a $250 Cash Award! We love pictures of food and especially where friends and family are enjoying our products! 1- Fill out the form below. 2- Upload your picture(s) of “How you dress your dogs” with Texas Tailgate® Chili Sauce. 3- Include a picture of your can of Texas Tailgate® Chili Sauce or take a picture of your grocery store receipt and upload it too. 4- We will reimburse you up to 89¢ for your store purchase of your can of Texas Tailgate® Chili Sauce via PayPal® deposit. (Be sure to fill out the form completely) So you’ll get a free* can of Texas Tailgate® Chili Sauce just for sharing “How You Dress Your Dogs”! Offer is valid for redemption of one (1) can of Texas Tailgate® Chili Sauce (Hot or Regular) per receipt or household. 5- All photo submissions will be automatically entered into the Grand Prize $250 Cash Award contest. Offer valid August 24, 2017 through October 8, 2017. Entries received after 11:59pm Eastern Standard Time on Thursday, October 8, 2017 will be void. Deposits to Paypal® accounts for valid 89¢ reimbursement on one can of Texas Tailgate® Chili Sauce will be made on daily basis. Please allow 24-48 hours for the deposit to appear in your account. How Grand Prize Winner Will Be Determined: There will be one (1) Grand Prize Winner to be selected by a by an independent judging organization, from all eligible photo entries on approximately October 13, 2017, and winner will be contacted by phone or email on or about October 15, 2017. No Purchase Necessary to be entered in the Grand Prize Contest. Simply upload your photos of “How you dress your dogs” with Texas Tailgate® Chili Sauce. There is a limit of one (1) entry, per valid email address, per household, for the Free Can of Texas Tailgate® Chili Sauce reimbursement offer. We cannot reimburse you for your can of Texas Tailgate® Chili Sauce without a store receipt. We will reimburse for a flat rate of 89¢ for each valid entry. TO ENTER OR WIN. A PURCHASE DOES NOT INCREASE YOUR CHANCES OF WINNING. OPEN TO LEGAL RESIDENTS OF THE CONTIGUOUS 48 UNITED STATES AND D.C., 21 YEARS OF AGE OR OLDER. VOID IN ALASKA, HAWAII, AND WHERE PROHIBITED. US residents only, no international payments. 1. How to Enter: Beginning at 12:00am Eastern Time (“ET”) on August 24, 2017 until 11:59 p.m. EST on October 8, 2017 (the “Promotion Period”), you may enter to claim your free can of Texas Tailgate® Chili Sauce and be entered in the $250 Grand Prize Cash Award Contest (the “Promotion”). You may enter by registering and uploading photos on our website at: http://boonebrands.com/how-do-you-dress-your-dogs/. Incorrect and incomplete entries are void. There is a limit of one (1) entry, per valid email address, per eligible person, for the Free Can of Texas Tailgate® Chili Sauce reimbursement. There is no limit to the number of photos you may submit to be entered in the Grand Prize contest. You may also enter via email to: news@boonebrands.com. Emailed entries must contain the following information: Name, Email, Mailing Address, Phone and PayPal™ Account Email Address. Attach photos to your message. By submitting your photos you agree to grant Boone Brands, its representatives and employees the right to use photographs submitted. You agree to authorize Boone Brands, its assigns and transferees to copyright, use and publish the same in print and/or electronically. You agree that Boone Brands may use such photographs with or without your name and for any lawful purpose, including for example such purposes as publicity, illustration, advertising, social media and website content. 4. Limitations of Liability: Texas Tailgate® and Boone Brands (“Sponsor”), and their respective affiliates, subsidiaries, parent, advertising and promotion agencies, and their respective officers, directors, shareholders, employees and agents, and any and all Internet servers and access provider(s) are not responsible for: any incorrect or inaccurate entry information; human error; technical malfunctions; failures, omission, interruption, deletion, or defect of any telephone network, computer online systems, computer equipment, server providers, or software, including any injury or damage to your or any other person’s computer relating to or resulting from participation in this Promotion; inability to access the Website; theft, tampering, destruction, or unauthorized access to, or alteration of entries; transactions that are processed late or incorrectly or are incomplete or lost due to computer or electronic malfunction or traffic congestion on the Internet or at any web site; printing or human or other errors; and any entries which are late, lost, incomplete, misdirected, stolen, or any combination thereof. Online submission is not considered proof of delivery or receipt. All entries become the property of Sponsor and will not be returned. By entering, you agree to release, discharge, indemnify and hold harmless the Promotion Entities, and their respective parent companies, subsidiaries, their respective representatives and agents, advertising and promotion agencies, promotion partners and prize suppliers, and all of their respective affiliated companies, employees, officers, directors and shareholders, from and against all claims and damages or liability arising in connection with your participation and/or entry in the Promotion and/or their receipt or use of any prize awarded in this Promotion or due to any injuries, damages or losses to any person (including death) or property of any kind resulting in whole or in part, directly or indirectly, from acceptance, possession, misuse or use of any prize or participation in any Promotion-related activity or participation in this Promotion. Any and all warranties and guarantees are subject to the respective manufacturer’s terms. Except where prohibited by law, the winner’s entry and acceptance of the prize constitutes permission for the Promotion Entities to use said winner’s photographs, likenesses, statements, biographical information, voices, and city and state addresses on a worldwide basis, and in all forms of media, in perpetuity, without further compensation. If by reason of a printing or other error, more prizes are claimed than the number set forth in these rules, all persons making purportedly valid claims will be included in a random drawing to award the advertised number of prizes available in the prize category in question. No more than the advertised number of prizes will be awarded. You further understand and agree that all rights under Section 1542 of the Civil Code of California (“Section 1542”) and any similar law of any state or territory of the United States that may be applicable with respect to the foregoing release are hereby expressly and forever waived. You acknowledge that Section 1542 provides that: “A GENERAL RELEASE DOES NOT EXTEND TO CLAIMS WHICH THE CREDITOR DOES NOT KNOW OR SUSPECT TO EXIST IN HIS OR HER FAVOR AT THE TIME OF EXECUTING THE RELEASE, WHICH, IF KNOWN BY HIM OR HER MUST HAVE MATERIALLY AFFECTED HIS OR HER SETTLEMENT WITH THE DEBTOR.” The releases hereunder are intended to apply to all claims not known or suspected to exist with the intent of waiving the effect of laws requiring the intent to release future unknown claims. 5. How Winner will be Determined: There will be one (1) grand prize winner (the “Grand Prize Winner”) to be selected by a juried panel from among all eligible photo entries on approximately October 15, 2017, by an independent judging organization, and winner will be contacted by phone or email on or about October 20, 2017. Decisions of Sponsor and Administrator with respect to Grand Prize Winner and other matters pertaining to the Promotion shall be final. A prospective Grand Prize Winner may be required to sign an affidavit of eligibility and release of liability and publicity (where permitted), and return same, properly executed, within five (5) days of issuance of prize notification. If Sponsor or Administrator is unable to contact the prospective Grand Prize Winner within three (3) days from first notification attempt, if the prospective Grand Prize Winner fails to complete and return all requested forms by the specified date, or if the prospective Grand Prize Winner fails to comply with any of the requirements, his/her prize will be forfeited and an alternate prospective Grand Prize Winner shall be selected. The odds of winning depend upon the number of eligible entries received. All correctly submitted entries will receive reimbursement for one (1) can of Texas Tailgate® Chili Sauce per email, person or household. The Grand Prize Winner will receive a $250 Cash Award, deposited into their PayPal® account. The specifics of all aforementioned elements of the Grand Prize in the Promotion shall be solely determined by Sponsor. All costs, taxes, fees, and expenses associated with any element of the Grand Prize not specifically addressed above are the sole responsibility of the Grand Prize Winner. All federal, state and local taxes on the Grand Prize are the Grand Prize Winner’s responsibility. Prize is non-transferable and no substitution will be made except as provided herein at the Sponsor’s sole discretion. Sponsor reserves the right to substitute the Grand Prize (or a component thereof) for one of equal or greater value if the designated prize should become unavailable for any reason. Some restrictions may apply. All other expenses not specifically identified as included in the Grand Prize are the sole responsibility of the Grand Prize Winner. 8. Disputes/Governing Law: All issues and questions concerning the construction, validity, interpretation and enforceability of these rules, or the rights and obligations of any entrant or the Promotion Entities in connection with the Promotion, shall be governed by and construed in accordance with the laws of the State of North Carolina without giving effect to any choice of law or conflict of law rules or provisions which would cause the application or the laws of any jurisdiction other than the State of North Carolina. Any action or litigation concerning this Agreement shall take place exclusively in the federal or state courts sitting in Lee County, North Carolina, and you expressly consent to the jurisdiction of and venue in such courts and waive all defenses of lack of jurisdiction and inconvenient forum with respect to such courts. Any and all disputes, claims, and causes of action arising out of or in connection with this Promotion, shall be resolved individually, without resort to any form of class action. You agree to service of process by mail or other method acceptable under the laws of the State of North Carolina. ANY CLAIMS, JUDGMENTS AND/OR AWARDS SHALL BE LIMITED TO ACTUAL OUT-OF-POCKET COSTS ASSOCIATED WITH ENTERING THIS PROMOTION. YOU (AND YOUR PARENTS OR LEGAL GUARDIANS IF YOU ARE A MINOR) HEREBY WAIVE ANY RIGHTS OR CLAIMS TO ATTORNEY’S FEES, INDIRECT, SPECIAL, PUNITIVE, INCIDENTAL OR CONSEQUENTIAL DAMAGES OF ENTRANT, IDENTIFIABLE PERSONS, OR THIRD PARTY PARTICIPANTS, WHETHER FORESEEABLE OR NOT AND WHETHER BASED ON NEGLIGENCE OR OTHERWISE. 9. Winner List: To receive the name of the Grand Prize Winner, send a stamped self-addressed envelope to: Boone Brands – Winners’ List, 2209 Boone Trail Rd, Sanford, NC 27330 within sixty (60) days of expiration of the Promotion Period.